Whether you love or hate Daniel Tosh, you gotta give him props for sticking up for the LGBT community every chance he gets. So, when gay couple Colin and Kelly were asked to never return to East Texas restaurant Big Earl's after being told "we don't serve fags," the Tosh.O staff sprung into action. Big Earl's also has a sign on the door that says "Where Men Act Like Men, Women Act Like Ladies." After interviewing the couple for a bit, Tosh.O suggested opening a competing restaurant next door to Big Earl's called Dallas Buyers Club & Grill. 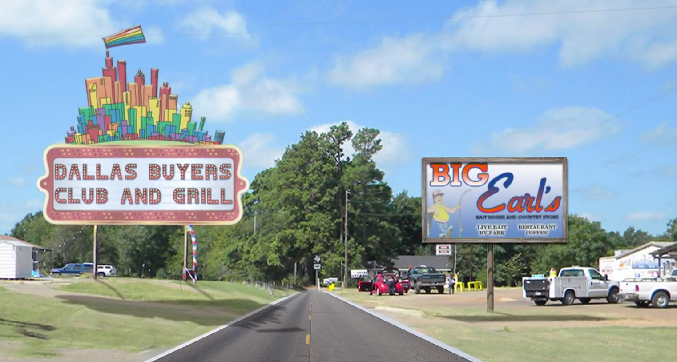 I am not sure if they really put a sign up across the street from Big Earl's or not, but in the skit, they did lampoon Earl pretty good with a bunch of photos of Earl's head superimposed on a naked bodies. Either way, the point was made pretty well. If you are going to be a bigoted jerk in this modern era, be prepared to pay the price.